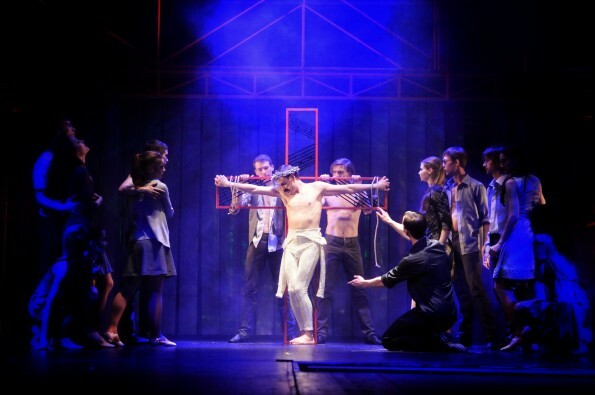 Libor Vaculík’s accla­imed dance musical Freddie – The King of Queen is a portrayal of the life and artistic career of Queen‘s singer Freddie Mercury, who became one of the most famous victims of AIDS. The J. K. Tyl Theater will dedicate the repeat performance on October 2 to the prevention and fight against this disease and will support the activities of the Positive Life charitable foundation. The performance on the New Stage will be followed by a few additions from QUEENIE band and the visitors will have an opportunity to see a photo exhibition in the foyer. There will also be an autograph ceremony with the main performers: Michael Kluch, Richard Ševčík, Iva Marešová and soprano Monika Sommerová, who will sing the famous opera duet Barcelona together with the band. The New Theater building will be illuminated in red all night long. „Freddie Mercury would have been seventy years old this year, and twenty-five years have passed since his death, so we have decided to make this performance special in way and help the good thing at the same time. We want to express our support for the Positive Life foundation, which has focused on preventing and fighting AIDS for a long time,“ says the theater‘s art secretary Michal Lieberzeit. From September 27 to October 2, an exhibition of black-and-white photographs capturing the everyday life of people infected with HIV will be placed in the New Stage foyer. The exhibition is traveling and besides Pilsen it could be seen in Prague, Munich and Zurich. In addition to photos, there will be information boards dedicated to the aforementioned patients in the foyer, through which they provide an opportunity to look into their private lives afflicted with the malicious disease. „I think the J.K.Tyl Theater contributes enormously to the prevention and fight against AIDS by having a performance about Freddie Mercury on the repertoire,“ said Miroslav Hlavatý, chairman of the foundation’s board of trustees. The patronage of the event was taken over by the Minister of Health of the Czech Republic MUDr. Svatopluk Němeček.